Yes, the dog looks like a mop. It’s supposed to look like that. 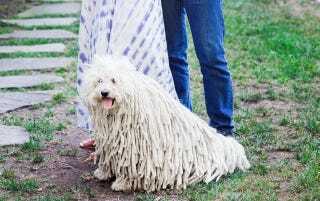 Zuckerberg’s dog (“Beast”) is a meticulously-groomed example of a small Hungarian herding dog called a Puli. The modern version is still fast, agile, and intelligent: and the qualities that make these dogs great for herding sheep can also make them engaging family pets. But it’s the hair that gets all the attention. The Puli’s long curls look like dreadlocks because they grow like dreadlocks. The dog has a thick, wooly undercoat and a long, dense overcoat; the two kinds of hair mat together as they grow, forming a grooming nightmare of long, thick, springy curls. A fully dreadlocked Puli can take an hour to bathe and its fur can take up to three days to air dry. Think you’ll speed things up with a blowdryer? You’re still in for six hours of wet dog. Fail to get your Puli dry enough, and those cords can start growing mildew. On the plus side, they don’t shed much. Why did Hungarians want to keep wet, mildewed dogs? The Puli’s curls have some advantages: they keep the dog’s skin dry and insulated from heat and cold–a good trait for an animal that’s supposed to be outside with the sheep in all weather. The Zuckerbergs will soon find out whether they can also absorb spit-up. Let’s see if they “Like” that.